If someone asked you when - or what- your first cooking experience was, would you be able to tell them without thinking? I have no specific childhood recollections of getting my hands covered with gooey dough, or licking chocolate cake batter off the beaters. This is largely due to the fact that my maternal grandmother did the bulk of the baking, and her kitchen was upstairs from ours. I do, however, have fond memories of watching “Yeranuhe Nanny” turn simple ingredients into amazing recipes. We were fortunate to have lived on the first floor of my grandparent’s 2-family house in Clifton, NJ. They chose to live upstairs (guess it reminded them of their mountainous homeland as they climbed the steps to the 2nd floor). My aunt & uncle lived next door, and a number of my grandparents Armenian friends from the ”old country” lived on the same block. No Armenian back yard was complete without a grape arbor so, of course, one was planted. It took years before it was large enough to provide adequate shade for our picnic table, but more importantly, to produce enough grape leaves to provide the tender wrapping of the most delectable Sarma (Yalanchi). I can recall Nanny being very specific as to the harvesting of her grape leaves, usually May, when the leaves were large enough to use, but very tender for eating. “Middle-June is too late!“, she’d say. Preparing the leaves for use was another story. They were hand-picked at just the right time, gently cooked, drained, stacked, tightly wrapped for freezing so they could be used all year long. Fortunately, today we can purchase jars of leaves in our local supermarkets and specialty stores. No muss, no fuss. 2. Pat the excess water off each leaf. Set leaves aside. 1. Sauté the onions in the oil until slightly tender. Stir in the rice & cook 10 min. 2. Combine all of the other filling ingredients with the onions & rice. Cook another minute or two. Remove from heat. Let cool. 3. Lay one grape leaf on a flat work surface, shiny side down. 6.Place rolled leaves in a large pot on top of the lettuce leaves. Sprinkle with a little oil & salt. 7. Add enough hot water to cover the rolled leaves. 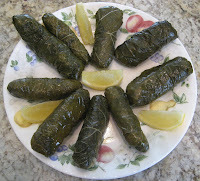 Place a dish on top of the grape leaves to keep them in place. You might want to add another weight, such as a small pot filled with water to place on top of the dish. This keeps the grape leaves submerged for even cooking. 8. Bring to a boil, then reduce heat to low and cook for 30-40 minutes until the rice is tender. 9. Remove from pot; chill; serve with lemon wedges. Oh, I see! The FIRST fold creates the ends, so it doesn't end up as a tube. Always wondered. Thanks for posting this! I tried it and it came out well! So excited to find this Web site. My childhood memories are filled with this food being served. My Nanny, who also lived upstairs from us, made a great Baklava, and her 5 sisters had their specialties. Their recipes were not passed down, so I am looking forward to preparing these dishes. I enjoy the prelude to the Dolma recipe. Being only 1/4 Armenian, I now feel 100% after reading it. Have just tried what I cooked. It tastes great! Thank you for sharing! An Armenian from England. That's what hands are for!